Lowering the high frequency noise in the current distribution, close to your device, is very effective. Due to popular demand we introduce a DIY (Do It Yourself) unit which can be safely built into a power strip, distributor or supply. 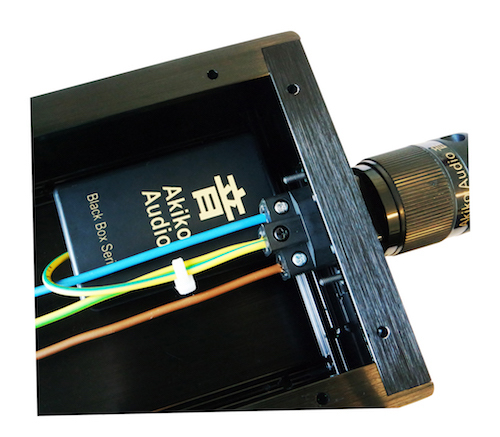 We let ourselves be inspired by the Harmonizer in the Akiko Audio Power conditioner Corelli. Placing the Power unit is easy and the improvements will surprise you. 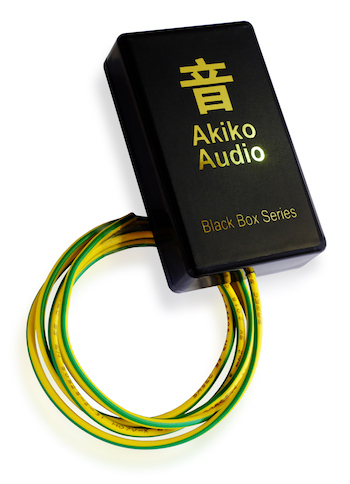 The Black Box Power unit comes with a meter long connection cable and should be built into the power distributor or supply. The cable should be connected to the central earthing point or to another place where the earthing is accessible, such as onto the IEC earth-connection. Also very suitable to be built into the housing of a power regenerator or mains filter. The housing is isolated, so completely safe to use once the unit is built in. Increased dynamics and energy in the listening room. Music sounds more lively and cleaner. You do not lose a socket if you build this unit into the current distribution. Dimensions: 85mm x 50mm x 22mm. Connection cable: 1 meter long 1,5mm² grounding cable, colour coded green-yelllow.